NEW YORK (WABC) -- A New York City Council member is taking a move out of quarterback Colin Kaepernick's playbook, and is now refusing to stand in a protest over racial injustice. 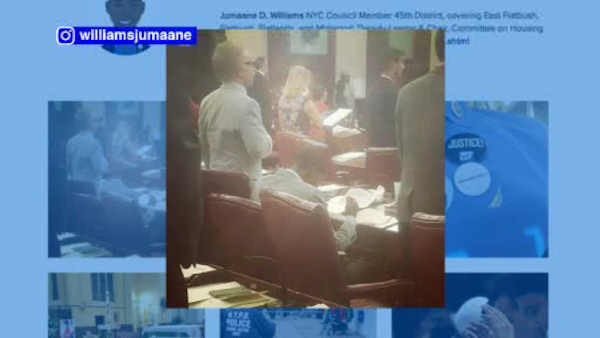 Councilman Jumaane Williams took a knee while other council members recited the Pledge of Allegiance Wednesday during a meeting. Williams released a statement that said in part, "I am choosing to recommit to this personal protest in solidarity with Colin Kaepernick, who has bravely decided to kneel down during the national anthem in tribute to oppressed Black Americans". Williams said he hoped that local professional athletes would be inspired by Kaepernick's actions and join in his protest. Kaepernick once again kneeled during the national anthem before the San Francisco 49ers' season opener against the Los Angeles Rams. Kaepernick has refused to stand for the anthem all season in protest of police brutality and racial oppression in the United States. Several other players around the league took part in similar protests on opening weekend.